As a reader, we first spend some time in the present, where the speaker is gardening. The season has changed, and the ground is left bare with little trace of the bounty of summer and fall. From here, we are pulled into a memory of the speaker with his father. A metaphor is offered for their relationship, that of a rotten pear where a hornet is spinning in its "beautiful, glistening juice." Like many of our family relationships, someone you love is also associated with something that can sting. The hornet might hover most of the time, but once in a while, it will make its way into your skin. For the recipe, there were two directions to take, either food of the past (of the garden and its pear trees), or food of the present. I chose the present, where we find the speaker alone in his kitchen, eating a meal consisting of ingredients that no doubt comfort his memories as he reflects on the flawed relationship with his father. The last line gets me, too. "What more could I, a young man, want." While he may appear grateful and content on the surface, there is certainly some underlying regret and discomfort here. I think he wants more than he'll ever be prepared to share. Heat up a turn of extra-virgin olive oil in a large sauté pan over medium heat. Add the garlic, shallots, and red pepper; cook just until fragrant and the shallots have softened, 2 to 3 minutes. Add the snap peas, season with salt and pepper, and cook until just tender (they will continue cooking with the shrimp), about 4 minutes. Push everything off to one side and raise the heat slightly. Add the shrimp and allow them to start turning pink before stirring everything together and adding the liquid. Bring to a boil, then cook partially covered, until the shrimp are done and the sauce has reduced, about 7-10 minutes. (If the sauce needs a bit of help, add 1 teaspoon of flour to help it thicken). 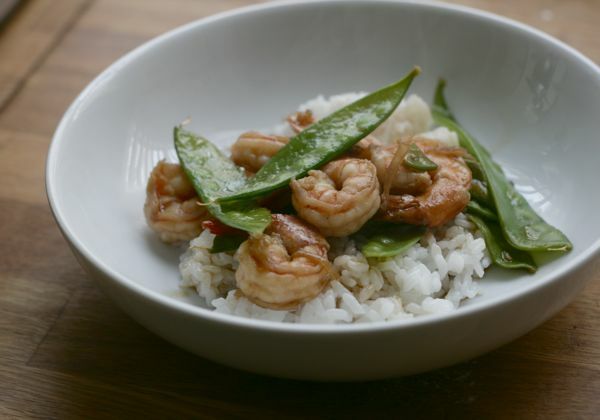 Serve in bowls over white rice.